UPDATED: Sat., June 23, 2018, 10:23 p.m.
Spokane Indians manager Kenny Holmberg is known as a defensive instructor, having served as the Texas Rangers infield coordinator the past three seasons. His new team is still learning the finer points of the discipline. 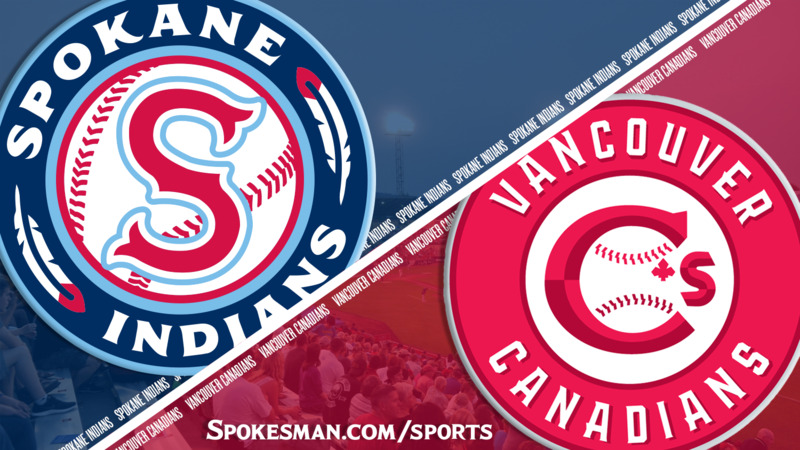 The Indians made two errors, had several other communication miscues, hit three batters and uncorked a pair of wild pitches on Saturday, and the Vancouver Canadians took advantage of just about every one. As a result, the Indians fell 7-4 in the first of a three-game Northwest League series at Avista Stadium. The Indians (2-7) have lost four straight. “We have to play better baseball,” Holmberg said. The big blow came in the fifth inning, as Vancouver catcher Chris Bec drilled a three-run double to the left-center gap. The hit came after the Canadians loaded the bases on a series of walks and hit batters. Indians starter Tai Tiedemann – the only returner from the 2017 rotation making his second start of the season – had a bit of a rough start, though his defense didn’t help much. With one down in the first, Chris Bec laced one into the right-field corner off the glove of a running Starling Joseph for a double. Bec was erased on a heads-up play by Tiedemann on a comebacker, but Griffin Conine reached on the fielder’s choice. Jake Brodt bounced one to short, but Cristian Inoa and Disobel Arias collided and it went for a single. Tiedemann walked Nick Podkul to load the bases but got Bryan Lizardo on a fly to left to end the early threat. In the bottom half, J.P. Martinez drew a walk to lead off, stole second base, went to third on the catcher’s throwing error and scored on a groundout by Diosbel Arias to give the Indians a 1-0 lead after one. Arias entered play hitting .407 in 27 at-bats this season. Vancouver (3-6) got the run right back in the second. McGregory Contreras reached on an error by third baseman Arias and Sterling Guzman was hit by a pitch. A sacrifice bunt moved the runners up, and a groundout brought Contreras home to tie the game. The Indians answered. Joseph led off the bottom of the second with a single on a soft looper over the infield. With two down, Joseph raced home on Isaias Quiroz’s double over the third-base bag and into the left-field corner. Defense let the Indians down again in the third. With one down, Brodt singled, went to third on an error by Inoa and scored on a groundout by Lizardo to tie it at 2. A wild pitch put a runner at third, but Jonah McReynolds made a diving stop at second to end the inning and save another run. Inoa sent one to the right-field wall with one on in the fourth, but Conine made a leaping grab on the track to end the inning. Tiedemann found trouble again in the fifth. Podkel walked, Lizardo singled and Contreras was hit to load the bases. Holmberg went to the pen for Chandler Sanburn. Sanburn walked his first batter to force in a run and after a strikeout he walked another to make it 4-2. It got worse. Bec barreled up a fastball that hit the wall in left on one hop for a bases-clearing double and Vancouver led 7-2. Tiedemann’s final line was a mixed bag. He allowed five hits over four-plus innings, but walked three and hit three more, surrendering five runs – three earned – with three scoring after he left the game. “I think that’s what happens with you have those defensive letdowns,” Holmberg said of Tiedemann’s erratic performance. “It’s extended innings where he shoulda, coulda, woulda been out of that inning. Tiedemann admitted to not being in sync all night. Left fielder Obie Ricumstrict smacked a solo homer in the bottom of the fifth – his first hit of the season in 14 plate appearances – to get the Indians within four runs. But eight of the next 14 Spokane batters struck out. The Indians did have a defensive highlight. In the ninth, Vancouver’s Contreras led off with a double and tried to score on a single by Tanner Kirwer, but Martinez’s throw was on target and Quiroz applied the tag to prevent another run. Inoa smacked a solo home run in the bottom of the ninth, his first of the season. Published: June 23, 2018, 9:44 p.m. Updated: June 23, 2018, 10:23 p.m.